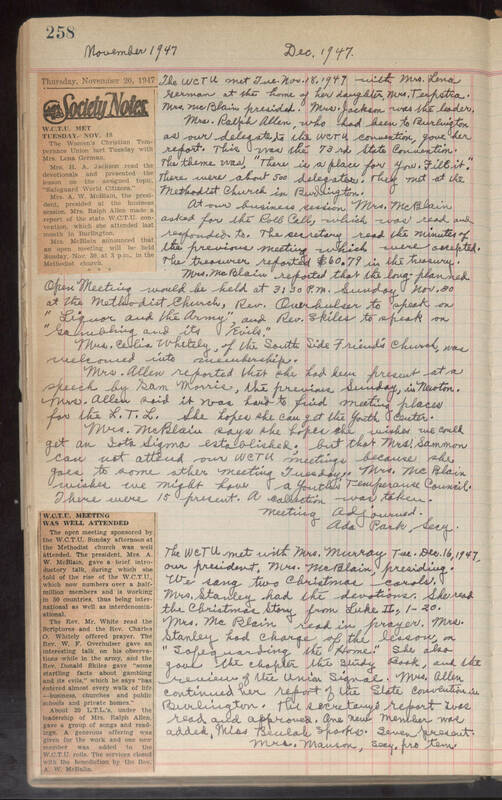 November 1947 Dec. 1947 The WCTU met Tue. Nov. 18, 1947 with Mrs. Lena German at the home of her daughter, Mrs. Terpetra. Mrs.McBlain presided. Mrs. Jackson was the leader. Mrs. Ralph Allen, who had been to Burlington as our delegate to the WCTU Convention, gave her report. This was the 73rd State Convention. The theme was, "There is a place for you. Fill it." There were about 500 delegates. They met at the Methodist Church in Burlington. At our business session Mrs. McBlain asked for the Roll Call, which was read and responded to. The secretary read the minutes of the previous meeting which were accepted. The treasurer reported $60.79 in the treasury. Mrs. McBlain reported that the long-planned Open Meeting would be held at 3:30 P.M. Sunday Nov. 30 at the Methodist Church, Rev. Overhulser to speak on "Liquor and the Army", and Rev. Skiles to speak on "Gambling and its Evils." Mrs. Celia Whitely, of the South Side Friend's Church, was welcomed into membership. Mrs. Allen reported the she had been present at a speech by Sam Morrie, the previous Sunday, in Newton. Mrs. Allen said it was hard to find meeting places for the L.T.L. She hopes she can get the Youth Center. Mrs. McBlain says she hopes she hopes she wishes we could get an Iota Sigma established; but that Mrs. Sammon can not attend our WCTU meetings because she goes to some other meeting Tuesday. Mrs. McBlain wishes we might have a Youth Temperance Council. There were 15 present. A collection was taken. Meeting Adjourned. Ada Park, Secy. [News Clipping] Thursday, November 20, 1947 Society Notes W.C.T.U. Met Tuesday. Nov. 18 The Women's Christian Temperance Union met Tuesday with Mrs. Lena German. Mrs. H. A. Jackson read the devotionals and presented the lesson on the assigned topic, "Safeguard World Citizens." Mrs. A. W. McBlain, the president, presided at the business session. Mrs. Ralph Allen made the report of the state W.C.T.U. convention, which she attended last month in Burlington. Mrs. McBlain announced that an open meeting will be held Sunday, Nov. 30, at 3 p.m., in the Methodist church The WCTU met with Mrs. Murray Tue .Dec. 16, 1947, our president, Mrs. McBlain, presiding. We sang two Christmas carols. Mrs. Stanley had the devotions. She read the Christmas Story from Luke II; 1-20. Mrs. McBlain read in prayer. Mrs. Stanley had charge of the lesson, on "Safeguarding the Home." She also gave the chapter the Study Book, and the review of the Union Signal. Mrs. Allen continued her report of the State Convention in Burlington. The secretary's report was read and approved. One new member was added, Miss Beulah Sparks. Seven present. Mrs. Manson, Secy. pro term. [News Clipping] W.C.T.U. Meeting Was Well Attended The open meeting sponsored by the W.C.T.U. Sunday afternoon at the Methodist church was well attended. The president, Mrs. A. W. McBlain, gave a brief introductory talk, during which she told of the rise of the W.C.T.U., which now numbers over a half-million members and is working in 50 countries, thus being international as well as interdenominational. The Rev. Mr. White read the Scriptures and the Rev. Charles O. Whitely offered prayer. The Rev. W. F. Overhulser gave an interesting talk on his observations while in the army, and the Rev. Donald Skiles gave "some startling facts about gambling and its evils," which he says "has entered almost every walk of life - businesses, churches and public schools and private homes." About 20 L.T.L. 's under the leadership of Mrs. Ralph Allen, gave a group of songs and readings. A generous offering was given for the work and one new member was added to the W.C.T.U. rolls. The services closed with the benediction by the Rev. A.W. McBalin.